The caption says: "We know what you're thinking and no, we are not related!" It may be interesting to know that “Nguyen” is the Australia's 13th most popular last name due to the high population of the Vietnamese community there. Click here if you want to learn how to pronounce it correctly. Another interesting fact is that after getting married, Vietnamese women still keep their surname. In Vietnam we don’t have the tradition of married women changing their family name to the husband’s. In my opinion, this is even better than some other cultures in terms of gender equality. However, similar to most other cultures, children inherit the surname of their father’s. Order of Vietnamese names: Family Name - Middle Name - Given Name. Vietnamese are addressed by their given name, even in formal situations. 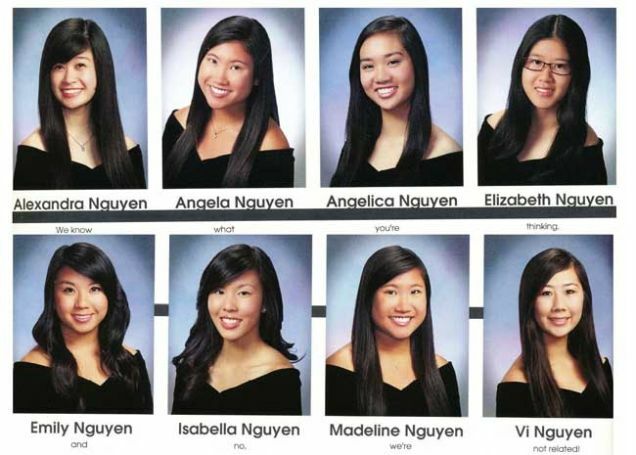 "Nguyen" is the most popular family name in Vietnam with nearly 40% of the population. Vietnamese women don't change their family name after getting married.